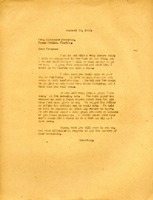 Letter telling Martha Berry that Virgina and her mother will be staying on mountain and cleaning house. 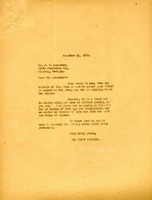 Letter from Martha Berry to her youngest sister and wife of Blue Diamond Coal Company president Alexander Bonnyman, Sr., Frances Berry Bonnyman. 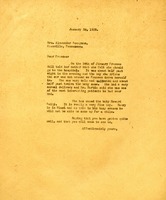 Berry reports that she is ill and asks Bonnyman to stop in Mount Berry on her way to New York. She informs Bonnyman that Bonnyman's sister-in-law, Mrs. James Bonnyman, would be welcome to stay with Isabel and Tom. Berry reports that the Rome newspaper has published untrue reports about the donations of Clara and Henry Ford, benefactors of the college. 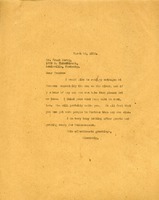 Henry Ford refuses to refute the newspaper's claims, and the college is receiving unwanted negative attention because of the contents of the article(s). 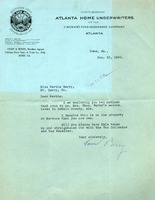 Tom Berry is asking Martha Berry to take up taxes owed on property in Mentone, Alabama from Mrs. Thomas Berry's estate. 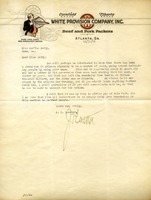 Letter regarding renting out cottages in Mentone, Alabama. A friendly Letter to Miss Elizabeth Berry from Martha Berry inviting her to come visit Berry and thanking her for her previous donations. 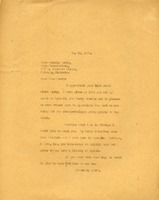 This letter from Martha Berry is thanking Cecilia for her kind words regarding the Berry schools, and Martha indicates that she would like to meet Cecilia should she ever come to Chicago. 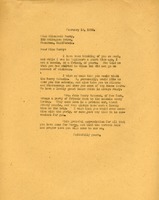 Cecilia R. Berry informs Martha Berry that if she is related to the Maxwell Berry family of Atlanta or Emma M. Lowry, then they are akin. 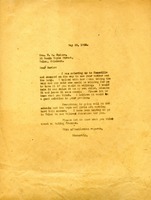 Ancrum Berry Burr writes to Martha Berry (courtesy of the National Broadcasting Company of New York City) to express his interest in returning to the South, the place of his family's origins. He explains that he is the son of Ancrum Berry Burr and Jane Dudley Burr along with other particulars of his family history and heritage. 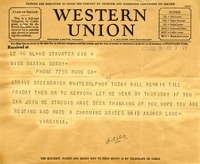 Bessie Rhea writes to implore Miss Berry to stay with her while she is in town for the women's club luncheon. Mr. J. T. Laseter's concern of fraud has been confirmed in Martha Berry's absence. The man from Atlanta calling himself Martha Berry's nephew is nothing more than a fraud, using the Berry name to defraud people of their money. Mr. J.T. Laseter informs Martha Berry of a situation in which a young man around the age of 30 is claiming to be the nephew of her sister's and is using her name to defraud people. Martha Berry tells Ladd how much she has been in her thoughts and thanks her for the Christmas candy that meant so much to the boys and girls. They took only one day for Christmas, keeping the students on campus so that they would not bring illness from home. Berry updates Ladd on Frances Ball's health, regretting that she had to leave her niece alone at Johns Hopkins Hospital over the holiday. 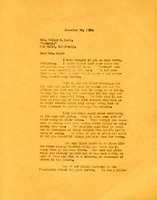 In this letter addressed to Merle, Berry proposes adopting Merle's baby and states that she will raise baby Frances as her own, providing money and education for the baby. Martha Berry writes to her sister Frances to describe the birth of Frances Ball's son, a "fine boy" she named Howard Kelly Ball. Since no one was available to drive her to the hospital, Frances drove herself and delivered her baby four hours later.